Bundle up and watch the trailer for Cold, a new TV show from New Form Digital. Cold premieres on Verizon’s go90 streaming platform, Thursday, October 13, 2016. 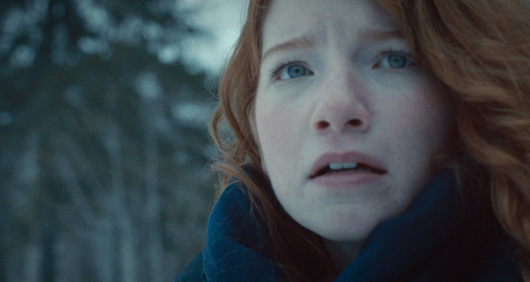 The drama stars Annalise Basso as Isla Wallis. The cast also includes: Todd Lowe, Jim True-Frost, Devery Jacobs, and Marcus-Johns. After learning she was adopted at the age of three, Isla embarks on a journey to her birthplace. The town residents are anything but welcoming. Eventually, she learns of the grisly murder that happened in her childhood home. Cold is created by Director Emily Diana Ruth with executive producer, co-creator and head writer Mike Sussman. Ryan Haas is Director of Photography. Watch the official Cold trailer from go90. Get the details from this New Form press release. Santa Monica, CA (September 29, 2016) – Today, New Form announced the cast of the upcoming young-adult thriller titled COLD, a combination of intrigue, mystery and heart-pounding thrills you don’t want to miss. Actress Annalise Basso (Ouija 2, New Girl, True Blood) is set to play lead, 16-year old Isla Wallis. Basso is joined by Todd Lowe (Gilmore Girls, True Blood) and Jim True-Frost (The Wire, Boardwalk Empire). Other cast members include Canadian actress and Screen Awards nominee Devery Jacobs and Vine star Marcus Johns. The 10-episode series premieres October 13, 2016, only on go90. Watch for free on go90.com or the go90 app, available for iOS or Android. go90 is currently delivering over 250 hours of exclusive original series from some of the industry’s most talented and interesting studios and creators. COLD follows Isla Wallis (Basso) who receives the shock of her life when she discovers that her real father (Lowe) is in prison for killing the mother she never knew. Furious at having been lied to, Isla runs away to the remote mining town where she was born. There, she learns of a series of horrific murders of First Nation women that may be tied to her mother’s death. With the help of Tina (Jacobs), a street-smart local, Isla starts to uncover the shocking truth behind these brutal crimes. Now, left for dead in the sub-zero wilderness, Isla will be pushed to the very edge — can she survive long enough to expose a dark secret that will shatter an entire town? COLD is created and directed by rising-star filmmaker Emily Diana Ruth, with Mike Sussman (Perception, 12 Monkeys, Star Trek) serving as head writer on the series. COLD was originally debuted as a pilot in New Form’s Incubator Series 2 in June 2015, garnering over 100,000 views to date on YouTube. Both the original pilot and series are executive produced by Kathleen Grace and Melissa Schneider. New Form is an entertainment studio that redefines how stories are developed, packaged and distributed. New Form empowers creators and audiences to produce original narratives that transcend traditional categories and platforms. Watch New Form series on a variety of global outlets, including CW’s The Seed, Refinery29, Fullscreen and go90, or go to newformdigital.com and learn more. go90 is a free, mobile-first, social entertainment platform that makes it easy and fun to discover, enjoy and share great content. Available on iOS and Android, go90 is part of the Verizon Communications family of companies. Built for the next generation, go90 brings together networks, distributors, creators, audiences and brands to deliver great experiences for the next generation. For more, check out go90.com. What do you think? Do you subscribe to the go90 streaming platform? Do you like the sound of the Cold TV series? Are you tempted to get go90, in order to watch? Tell us. More about: Cold, Cold: canceled or renewed?, go90 TV shows: canceled or renewed?